The Dollar/Yen fell on Friday as equities’ rout persisted throughout the trading session. Market sentiment shows mounting concerns regarding the global growth. Chinese trade figures came much softer than anticipated. Japan’s GDP grew at 1.9% vs the market’s estimate 1.8%, but the coincident index of business conditions for January was down 2.7 points, posting its third consecutive decline, suggesting conditions keep weakening. We have no major economic data coming out today, so traders' focus will remain on equities for any directional clues. The USD/JPY broke below 111.10 key support on Friday which is currently being retested as a new possible resistance. 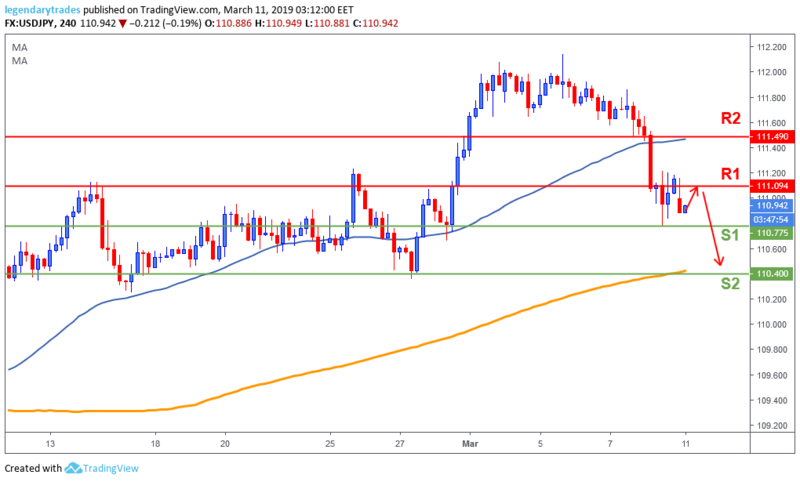 If price remains below this level and manages to break 110.77 (S1) then we could possibly see further weakness towards 110.40 (S2) which is also the 200-day moving average (orange line). A break above 111.10 (R1) the bulls could find momentum to take price higher and retest 111.50 (R2).